In a corner of the state inundated with undulating mountain chains and punctuated with soaring summits that include a generous number of 6,000-foot peaks, Yellow Mountain is far from western North Carolina’s loftiest summit at 5,127 feet in elevation. However, scaling this pinnacle of the Cowee Mountain chain involves one of the most punishing—and thoroughly rewarding—ascents in the southern Appalachians. 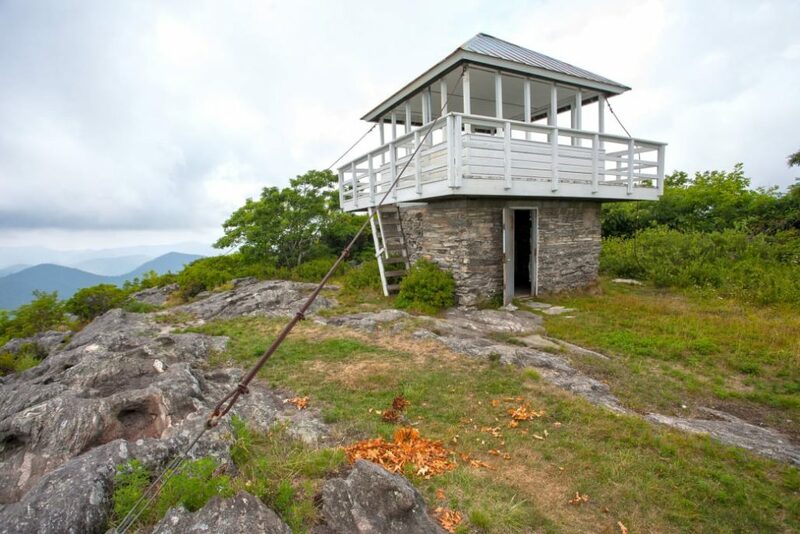 Aside from the brag-worthy climb, the craggy knob is also crowned with a historic fire tower that has become a well-weathered piece of Carolina mountain heritage. The tower guarantees that summit-baggers are rewarded with a seamless, panoramic view of the region. So lace up the hiking boots, load up on trail snacks, and head to western North Carolina to find out if the Yellow Mountain climb really is the hardest hike in the mountain-laden western corner of the state. Yellow Mountain rises from a swath of the Nantahala National Forest between Cashiers and Highlands, and its ascent requires a 4.8-mile (9.6-mile roundtrip) hike on a trail loaded with plunging dips and gritty climbs—all foreshadowing an equally punishing return route. But climbing the highest peak in the Cowee Mountains requires not only summiting Yellow Mountain itself but three additional peaks as well. Beginning at Cole Gap, the Yellow Mountain Trail kicks off with a bang as you almost immediately climb Cole Mountain before delving downward to Cole Gap and briefly bottoming out. Pits and pinnacles continue to dominate the trail, which continues on its way toward Shortoff Mountain. The ascent of Shortoff is dragged out along a series switchbacks snaking to the summit and reaching elevations of more than 5,000 feet. From the depths of Yellow Mountains Gap, the trail thankfully embarks on the final climb, ascending more than 2,000-feet to the top of the forest shrouded knob. At the summit, climbers are exponentially rewarded with a stunning panorama—an ocean of closely huddled southern Appalachian peaks stretching to the horizon. The 360-degree vista includes not only views of the rest of the Cowee Mountains that are nestled close to the Yellow Mountain summit, but it also showcases the Plott Balsam, Great Balsam, and the Great Smoky Mountains. While the views of western North Carolina’s mountain-dappled landscape are spectacular, the unassuming, century-old structure sitting atop Yellow Mountain is arguably one of the summit’s most compelling highlights. Fire towers once peppered the southern Appalachians as solitary sentinels ensuring the safety of the surrounding wilderness. The steadfast smoke-watchers manning the structures acted as an early alarm system, tasked with thwarting the widespread devastation wrought by forest fires. However, while some of the fire towers sprinkling the vast expanses of wilderness in the western United States are still in use, in the mountains of Appalachia, fire towers fell into disuse more than a half-century ago. Airplanes were deemed more efficient and economical for surveying seamless tracts of forest. The tower straddling Yellow Mountain’s summit was built in 1934, by Franklin Roosevelt’s Depression-era Civilian Conservation Corps, and it was used for more than three decades until 1969. Like many of historic towers dotting the Appalachians, the Yellow Mountain fire tower fell into disrepair when it was decommissioned. But thankfully it was preserved in the mid-1980s, and it’s now listed on the National Historic Register. Trailhead: The Yellow Mountain Trail is accessible from Cody Gap, off Buck Creek Road, off Route 64 about 8-miles west of Cashiers. Additional Information: The distance can be deceiving: The 4.8-mile ascent may not seem staggering, but plan for the rugged terrain to add time to the hike. Allow at least a half day for the hike—around 4 to 6 hours—depending on hiking experience and fitness level. Plan to bring enough water to cover the entire trek.